Guess who’s leaving for vacation on Tuesday… this girl! I’ll be gone for almost two weeks so of course I need to start emptying out my fridge. I still had some left over scallions from my Korean dish, some spinach and eggs so it seemed like the perfect time to make Froga tat-Tarja, a Maltese dish I’d read about. Malta is a country made up of a series of small islands in the Mediterranean. With its unique position between Sicily and North Africa and history of colonization by foreign powers such as Greeks, Arabs, France and England the culture is an interesting mashup of all. The Maltese have their own language, which is actually Semitic, but they’ve borrowed heavily from Italian and English which you’ll notice it the greeting at the top of this post. Similarly the food of Malta bears many of the same dishes as Sicily, but often use spices like cinnamon, nutmeg and ginger. Froga tat-Tarja is a Vermicelli (or Angel Hair) omelette. In my research I found that there are only two absolutely necessary ingredients; thin pasta and eggs. Once you have that as a base you can use anything you want. My mind reeled with possibilities. Maltese cooks use leftover chicken or whatever veggies they have lying around. I’d seen several recipes online that used pancetta, a few that used ricotta and one that even used tomato sauce, but I’m leaving soon so I needed to start getting rid of what I had in the fridge. A quick look turned up some spinach, parmesan cheese and scallions still left from my Korean dish and a recipe was born! Crack eggs in to a large mixing bowl. Add salt and pepper and beat eggs as you would to make scrambled eggs. Stir in cheese, scallions, spinach and spices then fold in the pasta mixing well to make sure the pasta is coated and the mixture is well incorporated. In a medium saute or frying pan heat olive oil over medium high heat. Pour the pasta mixture in to the pan and smooth out to form an even layer. Cook until browned, about 5 minutes then flip and cook about 5 minutes more. Turn out on to a plate, slice in to wedges and serve with a light salad. Serves 4 as an entrée, 6 as an appetizer. What a great use for leftovers! The texture of this dish is wonderful; crispy in the outside and sort of fluffy/spongy on the inside. I didn’t love the spice I used, but I will definitely make this again and would love to try it with ricotta, garlic and whatever else I have lying around. I’ll be leaving on a jet plane tomorrow at 5:30pm. I doubt I’ll do any blogging while I’m away so don’t expect much from me for the next couple of weeks. 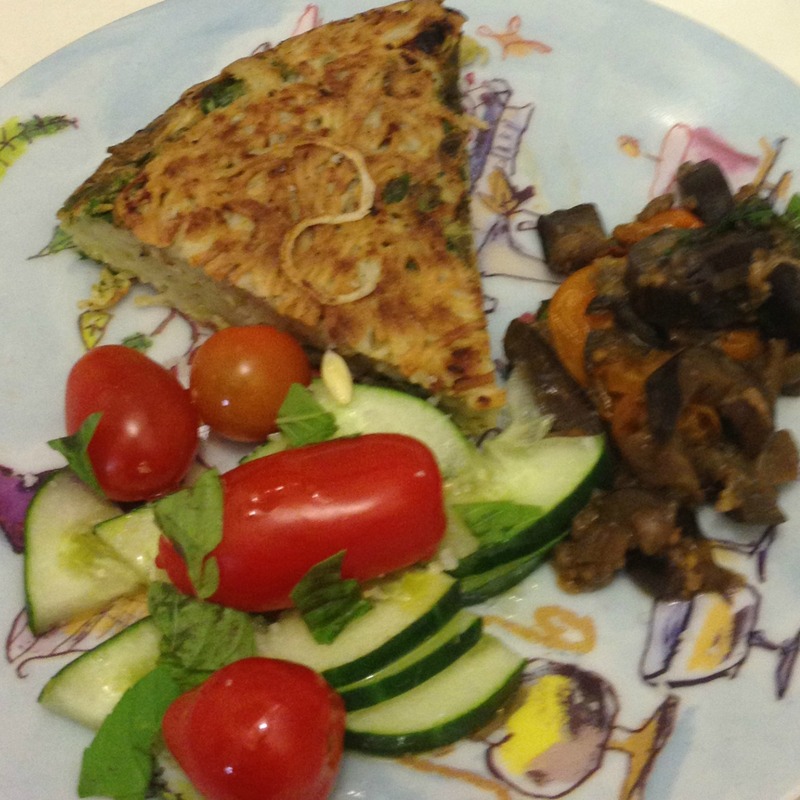 This entry was posted in Uncategorized and tagged Malta, Recipes, Vegetarian. Yum! That sounds delicious! The husband of a friend from grad school is from Malta. He has the most adorable accent. I will have to ask him if he has made this dish before!! Have a WONDERFUL trip!! I can’t wait to hear all about it!!!! !